I personally love Mondays, because they are my day off. Yesterday I spent some time with my parents, while my children went to their cousin's swimming birthday party. I took my mother to the antique store! What a fun visit! I will be sharing my creation with other Make it Monday fans. I had some time today to play today and found a few challenges to enter this week. For the challenge at Tuesday Throwdown wk 90: Spring cleaning I used one of my favorite Bluebird die cuts, some pink buttons a tiny doily flower and one of my favorite embossing folders. The papers are all ones I created in GIMP, and these are all scraps of my favorite pieces. 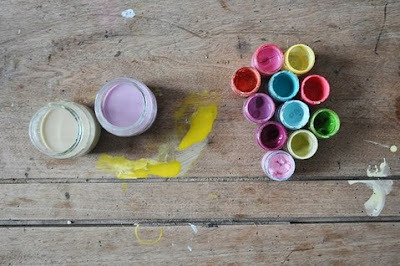 The Paper Play Challenge for week 12 is spring colours, which is perfect to enter this week!! Paper Sundaes: Spring Blossoms is perfect for my creation too. Fashionable Stamping Challenges Spring is in the Air , is another perfect challenge for me to enter this week. They ask that you use a STAMP for all of their creations. I am going to clean up my studio and find all my stamps!! I used my favorite background stamp that I drew and carved myself to use on the lower half of my card. I used Ranger's Peeled paint distress ink for my stamping. You can see all of this in the close up below. The Bluebird die cut (one of my favorite images from the Graphic Fairy)and other pieces were all cut out using my Black Cat Cougar which I purchased here. I just love the Black Cat Forum. I distressed all my edges with Old paper Distress ink and added some Perfect Pearls in Perfect gold around my embossed piece and tiny pennants. I used some pop dots to elevate my "Tweet" and my little pennants. I thought I would also share some of the weirdness that goes on at my house. Here are my two boys, goofing around while I am trying to get photos. LOL..noticed how I spelled WRONG..."WORNG"..I guess I will face palm myself now...LOL. Have a fabulous Day and thank you for visiting!! Gecko Galz blue and Green Challenge. Gecko Galz Paper crafting Yahoo Group. All you have to do is click the button that says "join this group"
when you do, let them know that Heather sent you :0) pretty please. 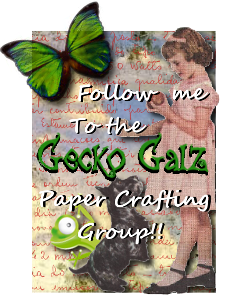 I used Inkscape to do the "Get Creative with Gecko Galz Digi Papers and Stamps." I also created cut line for my project in Inkscape. Normally I would of used my Black Cat Cougar to cut this out. But I got a new laptop and I have to have my DH help me set things up. For some reason instead of my files going to my cutter they are going to the printer...LOL. I used perfect medium pen to do some doodles on butterflies and around the edges of my ribbon. I then applied perfect pearls in perfect copper to give it a added touch. Used Ranger Liquid pearls in ocean blue to add some dimension . I cut out an extra set of butterflies, to add dimension as well. I used the Gecko Galz Fairy Boarders set of clear stamps, specifically the butterfly one to create my pattern on the "paper ribbon" part of my Blue Ribbon. I used Ranger's chipped sapphire with the border stamp to stamp on the edges of both sides of the papers. Then I used Peeled paint distress ink on the stamp and stamped a few butterflies down the center of each paper ribbon. Again, added some perfect pearls in perfect gold. Please come and join us at the Gecko Galz Yahoo Group. I am off to work in my garden. Had a little time to play today. I have a Beautiful ATC Tag that I created using a collage sheet I created myself with some Graphic Fairy Images and background paper I created myself. you can purchase it in my Etsy. If you visit the The Shabby Tea room (it is their 2nd birthday..fabby prizes ..so stop for a visit)...you will see that I have many colors from the inspiration photo. I embossed the little butterfly square at the bottom of my tag. Inked the raised portions with Ranger's old paper distress ink. I have flowers on the ATC Collage itself..as well as some flowers from Pro 31 Designs Etsy. You know I love using Beading wire in my projects, so I created my own clip for the Tuesday Throw Down Challenge, I tied a green with polka dots ribbon to it. Gives it a great artsy look. I used my favorite background stamp (that I carved) and peeled paint distress ink to add the leaves and flower around the edges of my project. I used it on the back too, as well as a "Happy Birthday" stamp that came in bunch of stamps I bought online (they were used, not sure who the maker is). The stamping and the button, vintage and flowers works for my BINGO (plus a few others) for the Fashionable Stamping Challenge. Look at that fun Pink Crystal flower..perfect for the Allsorts Challenge. You can find it, the flat back pearls, Ivory Curly rose, and pearl spray at Pro 31 Designs. You can just barely make out the embossing. Now that I see this close up, I think I will add some of the liquid pearls in lavender like I did on the rest of the card. It will be fabby! Here is the back. This side I did in a light pink background, but for the collage I made a darker pink one (I will probably list both). The bumble bee is a die cut I created in the past from a Graphic Fairy image. I also did some doodling on both sides with my perfect medium pen and perfect gold perfect pearls by Ranger. So please stop by and visit all these wonderful challenge blogs! Lots of creativity and inspiration! 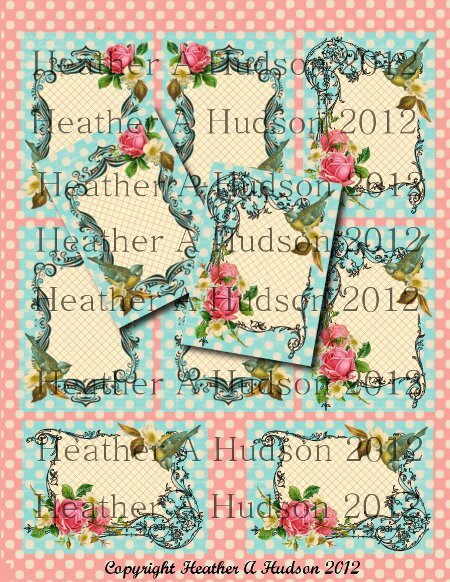 Today I spent some time creating a new card using some digital stamps from Gecko Galz. I used a Bunny Rabbit digi which I left black, and put onto a background that I created in GIMP. The adorable little girl holding the bunny I painted in GIMP. I created the background behind in GIMP as well. 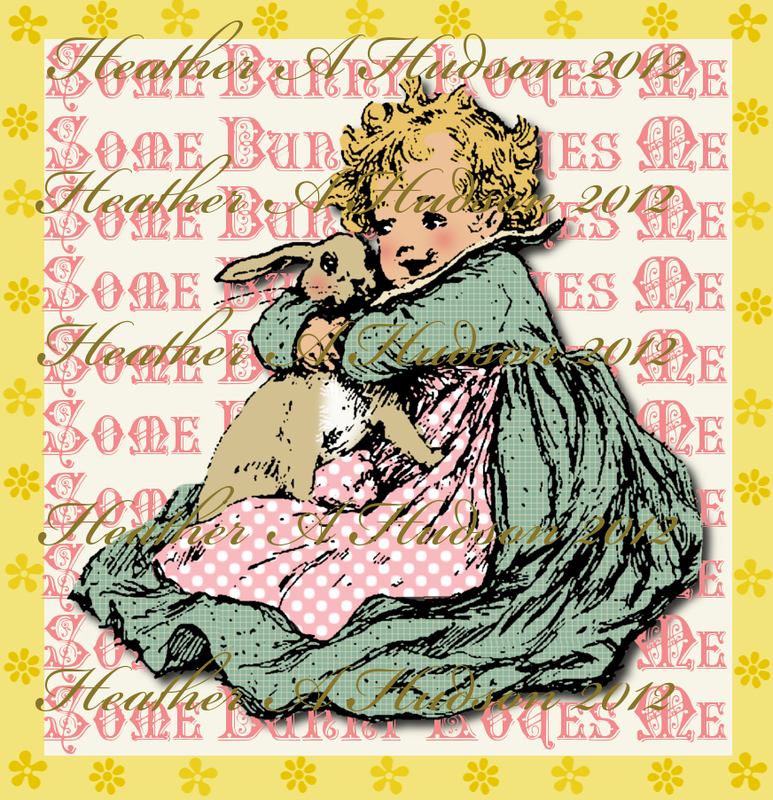 I used some brushes and the dodge burn tool to create the little yellow flowers, I used the Text tool to add the "Some Bunny Loves Me" text. By the way, it is The Shabby Tea Room's 2nd birthday, and they are having a fabby week of giveaways!! You can visit them here. Here is the digi image I colored in GIMP below. I created some polks dots on her apron, and her dress has a small checked pattern too it. I added some shading on the face of both the little girl and bunny. Did this using the paintbrush tool and smudge tools. (I am giving all the info for those girls that are GIMPING with me). I found a new Challenge blog this past weekend, called The Pink Elephant. What a fun name!! They too have a photo for inspiration this week. 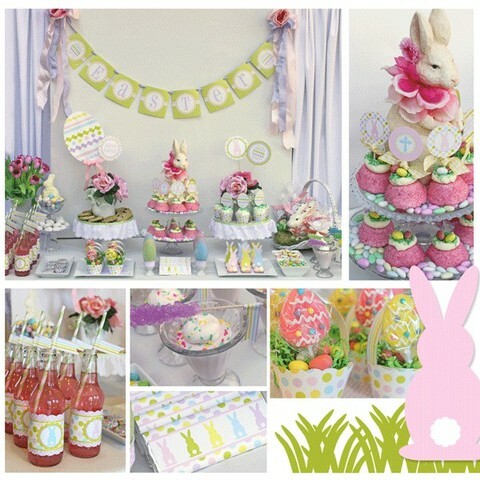 You will see that I chose to add the Gekco Galz bunnies, yellowish green, pink and some ribbon for my project from TPE inspiration photo below. This week at Simon Says Stamp and Show it is ANYTHING GOES. I also will be sharing with The ABC DT Springtime challenge. Here is my card. You can see that I embossed the creamy yellow cardstock with a cuddle bug embossing folder. Then inked the raised areas with Ranger's Vintage Photo distress ink. Another new challenge Site Called Fashionable Stamping Challenges has the challenge to use a stamp (digital doesn't count) and to play bingo by picking three in a row from the bingo card below. I picked Flowers, buttons and Vintage ( and words, distressing and flowers and almost a bow..lol). I used three stamps that I drew out and carved myself. I stamped some leaves and flowers to my card using Ranger's Peeled Paint Distress Ink. I distressed all my edges with Vintage photo distress ink. My card is an Easel card. Below you can see the buttons, vintage style, flowers and words...."Easter Blessing"
Here is the card with the hidden tag exposed. You can see that I added some liquid pearls by Ranger in Lavender lace through out my card. Here is a close up of my hidden tag. The plan is to take a family photo and stick it on the hidden tag with a clip. Why a clip you ask???? Another Fabby challenge blog I found this weekend is the Tuesday Throwdown challenge. This week (89) is to add a clip! Which was perfect because I have a hidden tag of course...LOL..and needed something to add to it, so the tag can be easily removed. I took an ordinary pink paper clip, added a green polka dot ribbon, glued on a button and flatback pearl! I Love it! Here you can see close up some of the stamping and doodling I did with my favorite perfect medium pen and brushed on perfect pearls in perfect gold. The flat back champagne pearls, pearl sprays and pink ribbon Roses are all from Pro 31 Designs. I used some dusty attic leaves that I painted wedgewood green, shaded with dark forest green and tinted with cardinal red (delta acrylic paints), used perfect medium and UTEE. I created the shading to make it look as if the leaves have a flipped edge. I bought the Dusty Attic from my best friend's Brick and Mortar store Polly's Paper Studio. I am so excited!! She has moved to Downtown Dexter, and will be re-opening in a couple weeks! It will be so fun to go and sit at her store and play! of course my project wouldn't be complete without one of my favorite Graphic Fairy flower images. The creamy white flowers are one that I took from a Graphic fairy image and used GIMP to create a beautiful row of creamy white flowers. I can't wait to visit the challenge blogs to see what the designers have made! Gecko Galz Yahoo Group. We have some fun challenges, and a really cute blog button I designed that you can add to your blog. Hope you have a Fabulous day! Sorry about the long post, but there were a lot of new places I Found, and wanted to share! Tuesday Morning Sketches and Sugar Creek Hollow Challenges. 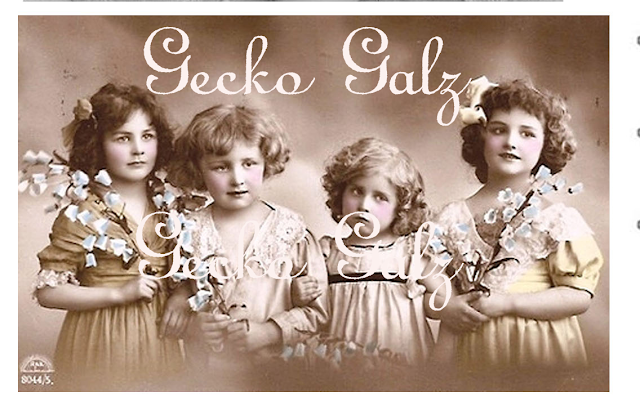 Gecko Galz and an adorable little lamb from the Graphic Fairy. 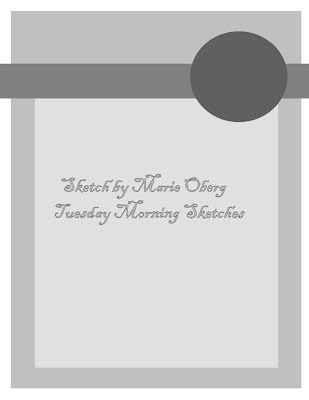 Here is the sketch from Tuesday Morning Sketches by Marie. The challenge at Sugar Creek Hollow this week is Monochromatic greens. Here is what I came up with. You may recognize my little gril and lamb from my Lilly Lamb's Vintage buttons and baubbles jar. I used GIMP to create all the papers, I then used Inkscape to create my cut lines, ...LOL..but my poor laptop's backlight went out, so I am waiting for a new one to hook up to my Black Cat Cougar. One of those, you can only use the software on a couple computers, so I will wait till I have my new one. I enjoyed the sketch because it has a lot of room for your own ideas. I inked all my edges with Ranger's Distress ink in Peeled Paint. I used Perfect Pearls in Forest green to add some faux stitching lines. I created my own polka dot paper (lol..took a while) and used some script brush to create the background paper. The Lamb and Clover are from the Graphic Fairy. Of course..it has a hidden tag...right?? Of course I threw a tag in there..LOL. I added a sweet Irish Blessing to the tag. It too is inked and has faux stitching. I did this one for the SCH Challenge...and the one below for the Sketch Challenge...although both go by the sketch. I did pretty much the same, but on this card I used Pink with polka dots behind my sweet image. The Pink Mulberry Rose, Ivory Drop beaded trim, and porcelain roses as well as the pearl spray all came from Pro 31 Designs. I inked the edges on this one the same as the first card, but this time I used Perfect Gold Perfect pearls by Ranger for my Faux Stitching. I used the same papers for both cards, just this one has the girl and lamb on pink. Hope you enjoyed the two Irish Blessings Cards. Please check out both Challenges! Today I had a fun time using some images from Gecko Galz and the Graphic Fairy to create a vintage looking collage. It says: Lilly Lamb's Vintage Buttons and Baubbles. I am using it to dress up this Kirkland brand spaghetti sauce jar that I am recycling below. I am sharing this post with The Shabby Tea Room and Simon says stamp and show some bottles and Sugar Creek Hollow. I just recently found this challenge blog site, you really need to check them out! You will love it! My buddy Carol, has already linked up!! Here is what I came up with. Just a note.. the collage is me...the rest of the bottle is a little more "foofy" than my norm. I still think it is pretty. My favorite colors! But still "foofy"
First I used a wide pink ribbon that I glued in place centrally around my jar. Then I used Pop dots to elevate the Collage piece that I created. Used some lace from my stash and then added my favorite champagne flat back pearls from Pro 31 Designs. I then added the pink pom pom trims, green with white polka dot sheer ribbon, and little liquid pearl dots in peacock. All the mulberry Roses and ivory ribbon lace (to create the flowers) came from Pro 31 Designs. I inked the edges of my collage piece with Ranger's broken China distress ink. Used a vintage button and my favorite May Arts leaf trim. I filled this with just a few of my antique buttons. Good thing I have a lot of these jars to play with (I got a lot of buttons). So..actually check back soon, because I will be selling them in my Etsy shop. Here is the die cut in a smaller size, I used it on the lid of my jar. I had the chance to play a little today between washing laundry and dishes (yuck). I thought I would work on the Shabby Tea Room Challenge as well as the Sugar Creek Hollow Challenge. Kind of glad I waited till today to start on my second entry at Sugar Creek Hollow. Why? 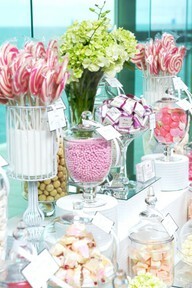 Because I am using this as my trash :0) Which works out great, because at the Shabby Tea Room the inspiration photo shows sweets (gum qualifies as a sweet in my book). Here is the inspiration photo from the Shabby Tea Room. Yummy!! We need to use pink, aqua and green, and add a tag to your creation. I pulled from the large suckers there on the left...the colors pink, darker pink and white and of course went to my favorite Gecko Galz Digital Papers (kitchen sink). They have both my favorite aqua and pink paper...LOL. So easy peasy for me! I used some Ivory mulberry roses, pink roses, champagne flat back pearls and pink blingy bling from Pro 31 Designs Etsy store. Used my "go to" May Arts Green Leaf Trim, and perfect medium pen with perfect pearls in perfect gold from Ranger. I used scraps of my favorite Gecko Galz papers, inked with Ranger's Distress ink in Fired Brick and Tumbled glass. The aqua ribbon was from my stash. Here is the inside. Awww...isn't that just so adorable!! I used some more of my scraps from my ritz box that was my "trash" in my previous Sugar Creek Hollow Challenge piece. You can see it here. The "Treat for you" words were left overs from one of my Shabby Tea Room Design Call entries. I was invited to be a guest designer for the month of July 2012. Here is one of the items I designed. I created the template myself :0), the rose in the upper right is the one I painted in GIMP. The fabby little teacup is from the Graphic Fairy. I used a vintage spoon image and collaged them together. I specifically designed it for the Tea Room. 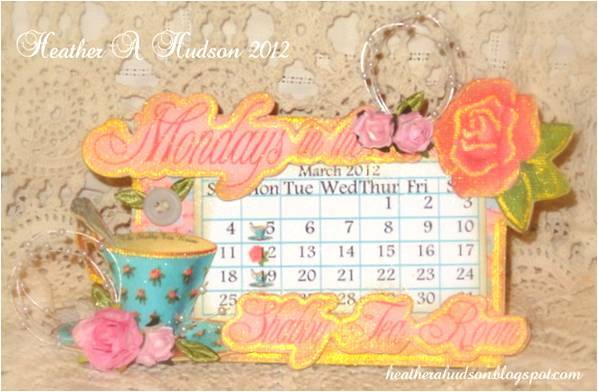 You can see it says..."Mondays in the ...Shabby Tea Room" I even created the little calendar myself. Talk about a lot of work..putting all those little numbers in there. I added little images on Mondays. So you wouldn't forget the challenges...LOL. Here is a close up of the bottom left...You can just barley see it, but I put the words "The shabby tea room" inside the teacup too. That is called "adding text to a path"...did that in GIMP..and I have a tutorial on that here (this will take you to youtube). I took 2 1/2 inch pieces by 3 inches and folded them in half to create my little pockets. Used my Crop O dile to punch holes and then added the little ribbons. Here are the little tags from the inside! They are just as cute as can be! I left them blank so the receiver can put what they want on them. I had some time to play today and thought I would share with you my tiny creation. Trash to Treasure Challenge at Sugar Creek Hollow. swap blog called Tabby's Swaps. So...I hurried over to Tammy's blog and signed up for the swap! I mean...HELLO...I will get a chance at getting one of Sandi's vintage girl mini cards! Of course I always have my favorites!! I couldn't choose between "Violet" and "Bluebell." (tons of images in there). Found one I wanted to use, and created a tiny digital image. It is 1 inch by 3 inches. We are to create 6 for the swap, and try to keep them flat. So most of my creativity is in the digital part!! First I cut it up into a bunch of 1 inch by 3 inch pieces. They asked at Sugar Creek Hollow that if you had any scraps, to use those too (but not as your trash..that would be cheaten..lol..we all have that kind of trash). So I found some pieces of my favorite Gecko Galz digital papers that I had goofed with on another project. Here are my little pieces with the Gecko Galz paper on the back. I inked the edges with Ranger's Fired brick on the pink, and Tumbled glass on the blue. I couldn't fit them all on there, so I changed it up a little. FlutterbyWednesdays since I added some wings to make my girl a fairy. The challenge there this week is open, you just have to have a fairy, butterfly or angel on your project. Here is my creation on paper. Isn't it just darling!! It is so vintage yummy! I used Ranger's Distress ink in Vintage photo for my little "I am inspired" words and tiny collage. flatback pearl scraps from Pro 31 Designs. I had a few vintage trim pieces left over from another project which I cut in half and put in the upper right corner of my creation. I topped it off with a piece of blingy bling that I had left over. To add to the "Heathery style" I used my perfect medium pen from Ranger to outline my piece and used my favorite Perfect Pearls in Perfect Copper. Gives it a nice glittery vintage look. I just have 5 more to create. I think mine will all be the same, since different people will be getting them. Here is a picture of the back. I used Fired brick on my little words. So check out Tammy's Vintage Mini Card Swap. I enjoyed creating this so much..I think I will design some more. Sugar Creek Hollow Trash to Treasure Challenge. I know if you are one of my online buddies...I know you love vintage...so check it out! !